If you like to play blackjack online, Vegas Blackjack by Amaya Gaming will be a good choice. The game is based on the classic blackjack rules, and up to 5 players can play at the same time. Although since it doesn’t support multiplayer gaming, you can play on all five of the betting boxes. 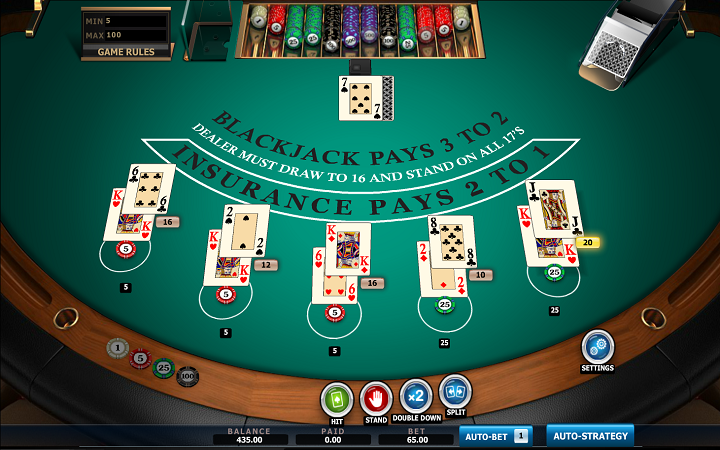 The interface consists of an image of a blackjack table, and it is very easy to play. 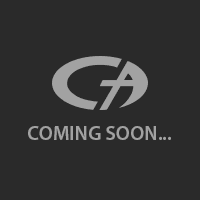 There is also an “auto strategy” option, which calculates the possible outcomes and makes the moves for you. It is extremely useful for new players, so we recommend checking it out. You need to place your bets to start the game, as usual. The poker chips located at the bottom left side of the screen are your wagers and they are in between 1 and 100 coins, as you can see. If you are unsure about your betting amount, you can use the “auto-bet” feature of the game. It automatically places bets for you, according to your balance. Click on the “deal” button to start the round. The classic blackjack rules apply – your goal is to reach a total of 21 or a total higher than the dealer. You can ask for more cards (hit) or no more cards (stand) according to your hand. If you choose to stand, the dealer will continue to play until he busts or gets a total higher than you. (The dealer is forced to stand if he has a total of 17.) You can also take an insurance during the main game. Blackjack pays 3 to 2, and insurance pays 2 to 1. You can start a new round with the same values by clicking on the “rebet & redeal” button. If you want to change any of these values, click on the “clear bets” button and start a fresh round. You must bet at least 5 coins to enter the game. 100 coins are the maximum bet amount – at least in the demo version. Speaking of the demo version, you get 500 coins in the free mode and it is more than enough for hours of gameplay. Vegas Blackjack is a classic blackjack game online, and it can be used to practice or for casual gaming. Play at Casino Avenue to find more blackjack games and variants!